From enchiladas to pulled chicken sandwiches, I have so many amazing recipes that call for shredded chicken. I never seem to make them, however, for the very simple reason that shredding the chicken takes entirely too long. Cutting the chicken with a knife and fork results in the pieces being too big, and trying to shred the chicken with a fork just never works out well. I have had some success with a Crock Pot, but that requires me remembering to get the chicken started two or three hours in advance, and I don’t always have the time. That is why I was so excited when I found out a new way how to shred chicken. This new technique is super simple and super fast–I can’t believe I didn’t think of it before! It also eliminates any touching of the meat I have to do, as a vegetarian I’m loving not having to get physical with the meat. Now, instead of trying to shred chicken with a fork and knife, I use my KitchenAid stand mixer to shred my chicken instead. The beater attachment is absolutely perfect for the job, and it only takes about 30 seconds! Talk about fast and easy! 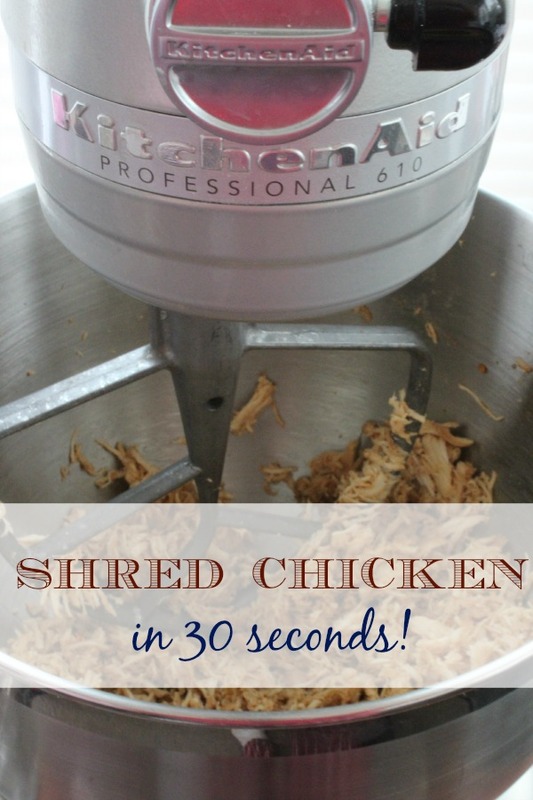 Now that I learned the secret for how to shred chicken in 30 seconds, juicy shredded chicken is back on the menu! Enchiladas, pulled chicken sandwiches, chicken for on top of salads… we’re having them all! I just used this method for shredding the chicken for my Buffalo Chicken Lasagna recipe. (I split the recipe into two pans – one for now and one for the freezer for later!) I love learning new kitchen hacks to make cooking easier, and this is definitely one I’ll be using time and time again! Take your meat straight from cooking and toss it in the mixing bowl. Make sure the beater attachment is in place. Raise the bowl and hit a low power setting for about 30 seconds.